In its current state, Chateau de la Gardine dates only back to 1947. However, the property has a much longer history in Chateauneuf du Pape dating all the way back to at least the early 1700’s. When the estate was purchased by the well-known Brunel family in 1947, the vineyards were in poor shape after years of neglect and World War 2. At the time, the property at its best had about 10 hectares cultivated with vines. The Brunel family, headed by Gaston Brunel began replanting the vineyards in their Southern Rhone Valley vineyards, expanding the estate and building the tower that is an important part of the landscape today. The winery was renovated again in 1989, this time with stainless steel fermenting tanks. Since purchasing the estate with its original 10 hectares of vines, the Brunel family has managed to grow the vineyards into their current 52 hectare size today. Currently, Chateau de la Gardine is managed by Marie-Odile Brunel. While most estates in Chateauneuf du Pape have vines spread out over the appellation, that is not the case with Chateau de la Gardine as most of their vineyards are next to each other in the north west section of the appellation. The 52 hectare vineyard of Chateau de la Gardine has a terroir of gravel, loam, limestone and pebble soil. The oldest vines were planted in 1925. 48 hectares are planted for the production of red Chateauneuf du Pape wine. 4 hectares are reserved for the white wine. The wines of Chateau de la Gardine are aged in a combination of small, French oak barrels and foudres. The best vintages of Chateau de la Gardine are: 2018, 2017, 2016, 2015, 2012, 2010, 2009, 2007, 2005, 2001, 2000 and 1998. 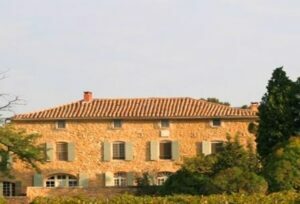 Chateau de la Gardine produces 4 red, Chateauneuf du Pape wines and one Chateauneuf du Pape Blanc. Chateau de la Gardine Chateauneuf du Pape – 60% Grenache, 20% Mourvedre, 15% Syrah, and 5% Muscardin. The wine is aged in a combination of vats and barrels, on average this works out to 60% in vats, and 40% in barrel for close to 12 months. On average the production is about 11,500 cases per year. Chateau de la Gardine Cuvee des Generations – 60% Grenache, 20% Syrah and 20% Mourvedre 20% Syrah. The wine comes from some of their oldest vines, some of which are more than 100 years of age. The terroir is rocks, stones, limestone, sand and clay soils in the la Gardine vineyard. The wine is aged in up to 100% new, French oak barrels for between 14-16 months. 800 cases are produced each year. Chateau de la Gardine Cuvee Peur Bleu – 50% Grenache, 25% Syrah and 25% Mourvedre. The wine is aged in tank for between 12 to 14 months. This is an odd wine and a bit experimental. Chateau de la Gardine is making what is called a natural wine, meaning that it was bottled without any sulfur, making it unstable for long term aging. The wine is not produced in every vintage. The production is small with only 250 cases made per year. Chateau de la Gardine Cuvee l’Immortelle – 34% Grenache, 33% Mourvedre and 33% Syrah. The terroir is pure galets in the La Gardine lieu-dit. The wine is aged in a unique shaped vessel, short, conical French oak tank. Very little wine is produced making this impossible to find. Production is about 90 cases per year. Chateau de la Gardine Chateauneuf du Pape Blanc is a blend of 45% Grenache Blanc, 25% Clairette, 20% Roussanne and 10% Bourboulenc. Chateau de la Gardine can be enjoyed on the young side. Young vintages can be popped and poured, or decanted for 1-2 hours. This allows the wine to soften and open its perfume. Older vintages might need very little decanting, just enough to remove the sediment. Chateau de la Gardine is usually better with 3-5 years of bottle age. Of course that can vary slightly, depending on the vintage. In the best vintages the wine should be consumed within 5-15 years after the vintage. Domaine de la Gardine is best served at 15.5 degrees Celsius, 60 degrees Fahrenheit. The cool, almost cellar temperature gives the wine more freshness and lift. Domaine de la Gardine is best served with all types of classic meat dishes, veal, pork, beef, lamb, duck, game, roast chicken, roasted, braised, stewed dishes, sausage, barbecue and cassoulet. Domaine de la Gardine is also good with Asian dishes, hearty fish courses like tuna, mushrooms pasta, eggplant, cheese and tomatoes. The white wine of Domaine de La Gardine is best served with a myriad of different seafood dishes, shellfish, crab, lobster, sushi, sashimi, chicken, pork and veal, as well as Asian cuisine. The family also produces wine in the Cotes du Rhone appellation and in Rasteau as well. Big, deep, powerful, fleshy and alcoholic, this makes quite an impression with all its layers of ripe, dark sweet, ripe, flesh fruits. Ripe, round, dark and juicy, the oak is out in front to greet you, followed by espresso, deep, dark waves of fruit, lush tannins and an opulent textured finish. Deep in color, with molten black cherries, licorice, smoke and espresso beans that just keep on coming The wine has weight, depth, volume and character. Give it a few years to better integrate all its moving parts. With volume and depth of flavor, the wine offers up its dark, red cherries, coupled with pepper, thyme and herbs with ease. Polished and long, with a saline quality, adding nuances to the finish, this should age and develop nicely. .
Lush, fat and forward, there is a touch of wood, but there is ample fruit here to move past that point, leaving you with spicy, dark red berries, herbs and kirsch in the finish. Layers of fat, dark, juicy, fruits are easy to notice. From there, you find licorice, herbs and olives with more dark berries in the end note. This is a wine to drink you the side as there is never any SO2 used during bottling. Black raspberries with a saline quality to the minerality, fresh herbs and plums, the wine has a richness to the texture and much of the oak has already integrated. Modern in style, for sure, but that seems to really work in this vintage, giving the wine an extra element and additional roundness. With a kiss of oak at the start, the nose quickly moves to a cherry liqueur and Provencal herb profile. Polished, clean and made in an approachable style for near term drinking. Concentrated, rich and powerful for the vintage, there is a fatness to the texture, with lush textures that pair perfectly with the fresh, soft, peppery fruits. The blend of equal parts Grenache, Syrah and Mourvedre is very successful for the vintage. Lush, forward, round and fruity with a peppery, thyme accent that really shines with all the kirsch. The wine was made from a blend of 65% Grenache, 15% Mourvedre, 15% Syrah and 5% Muscardin. Deep in color, with a pronounced oaky aroma, which is going to be a problem for staunch traditionalists. The wine is filled with licorice, sweet, black cherries, smoke and garrigue. The luscious finish does show an oaky slant to the ripe, dark berries. Polished and supple, with soft tannins and a rich, velvety, cherry and kirsch center. Using an almost equal blend of Grenache, Mourvedre and Syrah, the wine reached 15% alcohol. Fresh, dark, ripe berries, herbs and spice are present all the way through until the kirsch finish kicks in. Blending 65% Grenache, 15% Mourvedre, 114% Syrah and 1% Muscardine produced a wine that reached 14.5% alcohol. Medium bodied, easy going, simple, peppery, red fruits are presented in a pleasant, straight forward manner. Still dark in color, with a depth of flavor that matches the level of concentration and ripe, fruits found here. It is easy to spot the old vine intensity, in all that dark, red fruit, licorice, spice, smoke and earth. This lushly textured wine should age and develop quite well. Modern in style, which is a bit drying on the palate due to the wood, the wine still offers ample layers of sweet, ripe, jammy berries and spice, along with hints of vanilla and coffee. Soft red cherries dominate this structured, concentrated tannic wine. Give this a few more years to develop. Nice traditional Chateauneuf that is drinking well, with its open, jammy kirsch, peppery, garrigue profile. Not much there, there, the little fruit remaining made a valiant effort to find its way though the all the earth, forest and tobacco notes. High in acidity, this is history, but not much in the way of a wine. Only a smattering of fruit remained, yet the wine was still interesting with its barnyard, horse, earth, garrigue and spicy personality. When you consider this is a 60 year old bottle of Chateauneuf du Pape, it was all things considered, showing quite well.